ESCO has created a series of Water Management Panels, that when installed in an RV or Boat distributes water to the proper fixture, and accomplishes a series of tasks that are integral to the operation of the RV or Boat. WMP’s offer the consumer a simple device that performs servicing functions needed to maintain an RV or Boat. 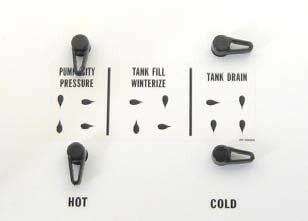 The Water Management Panels will allow the RV/Boat owner to simply turn a series of valves, changing from pump to city fill, by-passing the water heater, winterizing the RV/Boat, and at the same time, managing the entire units water systems - all in a small lightweight panel. 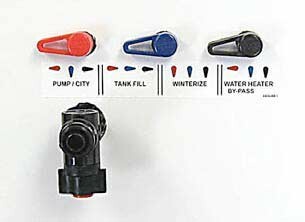 These WMP’s are manufactured with Flair-It fittings, white laminate, color coded valve handles and easy to read instruction labels. The small design allows the RV/Boat builder to incorporate the WMP into the vehicle’s storage compartments, allowing for easy access and bringing value to the end user. 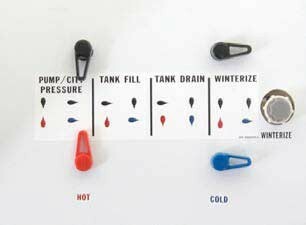 7” X 11” Panel For Pump / City Pressure, Tank Fill, Winterize. All orders over 5 pounds will be charged an additional cost for shipping and will be contacted directly by our friendly staff. 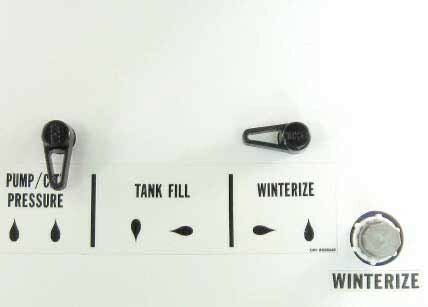 8 1/2” X 11” Panel For Pump / City Pressure, Tank Fill, Tank Drain, Winterize. 8 1/2” X 11” Panel For Pump / City Pressure, Tank Fill / Winterize, Tank Drain. 7” X 11” Panel For Pump / City Fill, Tank Fill, Winterize, Water Heater Bypass.